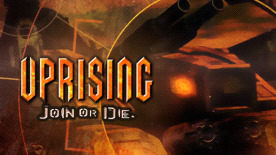 Uprising offers more strategy than a military sim, and more action strategy than a shoot'em up. Using your hi-tech assault tank, loaded with powerful weapons, you need to establish tidal bases, mine for power, build factories and direct legions of allied units against the enemy - all in an amazing 3D world. The path to the stars was heralded as a new beginning for peace, expansion and discovery. It did not happen. The oppressive Imperium power now controls the whole of known space, and the masses are restless. Now is the time to rise up and smash this regime.